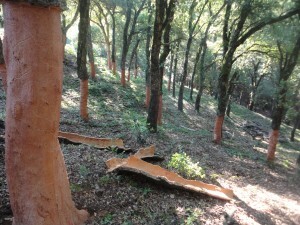 The main objective of the project is the implementation and transfer of innovative forest management techniques in cork oak grove to promote adaptation to climate change and to increase the resilience of forest ecosystems dominated by Quercus suber, thus promoting their conservation and maintenance of the value chain associated. To improve the vitality of cork oak and to reduce the effects of lower water availability, while cork production increases. To improve the structure of Quercus suber forests to reduce vertical and horizontal continuity of fuel and thus, the spread and intensity of wildfires. To improve the functionality and resilience of the degraded cork oak grove to climate change. To reduce damage caused by Coraebus undatus through biorracional population control (mass trapping) and reducing the probability of cork oak to be attacked. To develop management tools and transfer them to the forest administration, to integrate adaptation to climate change in forest policy and Catalan cork subsector regulations. To transfer the implemented techniques and tools developed to the main local actors and other actors involved to the european Quercus suber sector (Portugal, France and Italy), in order to improve the management and long-term preservation of cork oak habitat in Catalonia and southern Europe.